Johann Strauss the Younger had already cemented his reputation as The Waltz King by the time he wrote his operetta Die Fledermaus. In all, Strauss composed some five hundred dances, including one of the most famous pieces of classical music ever written, The Blue Danube. In Strauss’ time, Vienna was fast becoming the entertainment centre of Europe and increasingly his music was being heard and danced to in ballrooms all over the Austrian capital. What is surprising is that Strauss clearly doubted in his own ability to write for the stage when so many around him saw this as a clear opportunity for him to capitalise on the popularity his pieces enjoyed in Vienna’s concert halls. His first few operettas did not do well, but the Director of the Theater an der Wien, Max Steiner, clearly believed that a major success was just around the corner. When the French composer Jacques Offenbach, a champion of his younger musical contemporary, decided not to produce his own version of Die Fledermaus, the task fell to Strauss to create this gorgeous comedy of frivolity, infidelity and mistaken identity. Everything that happens in Die Fledermaus stems from ‘The Bat’ Dr Falke’s decision to embarrass his friend Eisenstein for having left him to wander home in costume after a drunken party. The Bat contrives to expose both Eisenstein’s and his wife Rosalinde’s taste for extramarital affairs by arranging for both of them to attend a ball in disguise. Eisenstein unwittingly flirts with his own wife while her lover languishes in prison. By the end of the piece, the characters reveal who they really are, but will they forgive one another? Premiered at the Theater an der Wien on 5 April 1874 and written to a libretto by Carl Haffner and Richard Genée, legend has it that Strauss feverishly set to work, barely putting his pen down to eat or sleep for six weeks. Certainly it is tempting to think that the febrile state in which the composer is presumed to have written the operetta created the frenetic energy that has entranced audiences ever since. 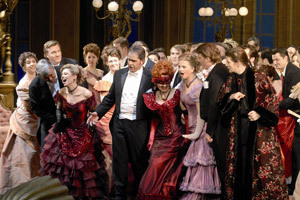 Now the Volksoper Vienna offers lovers of operetta, and of the uplifting music of Johann Strauss, the opportunity to enjoy his great work, Die Fledermaus, once again.